Can I just say that I LOVE seeing so many of my friends promoting different products through direct selling? Tax Scams 101: Don't get scammed in 2015! Many of us dread the thought of tax season, but others look forward to this time of year, especially the tax cons. Just how hard is it to be a Tiger Fan? President Obama's most recent federal budget proposal shows his intent to eliminate what has been termed a loophole in the tax laws regarding donations, specifically, the tax deduction allowed for donations that are required by universities for the opportunity to purchase season tickets for college sports. As I enjoyed the beautiful 70 degree weather as I left the office for lunch today, I had the surprising realization that another year has come and gone, and with the onset of Spring right around the corner, so is tax season! It's 4:59 on a Friday, and you're ready to get out of the office. Your eyes glaze over the computer screen as you patiently wait to jump out of your chair. You blink. Boom – 5:00. Your grab your coat, say the cordial goodbyes to your co-workers, and hop in your car. The traffic's terrible, but no worries; you know the shortcut through the neighborhood up ahead. You start to smirk as you drive through, bypassing all the traffic. All of the sudden – SCREECH – BAM. It looks like another car had the same idea, but he failed to stop at the clearly visible stop sign. Your car is totaled...and you? You've been better. This past holiday season, the topic of TIME kept coming up over and over again. There is a confirmed IRS phone scam circulating in the Baton Rouge service area. Scammers place phone calls claiming that the victims owe the IRS money and must pay immediately or suffer serious consequences -- including arrest and imprisonment! We are thrilled to be named the Face of Tax Resolution Law in the May-June 2014 Baton Rouge issue of Louisiana Life magazine! It's always rewarding to show the great folks of Louisiana what we do, and how we are different from the other tax resolution firms. It's just a fact – LOCAL is the way to go! "UPDATE: Louisiana Tax Amnesty 2014"
On Monday, May 12th, the Louisiana House of Representatives approved House Bill 663 – the 2014 tax amnesty law. Under the law, taxpayers who owe back taxes can save 67% of the penalties and 33% of the interest they owe on the overdue taxes. 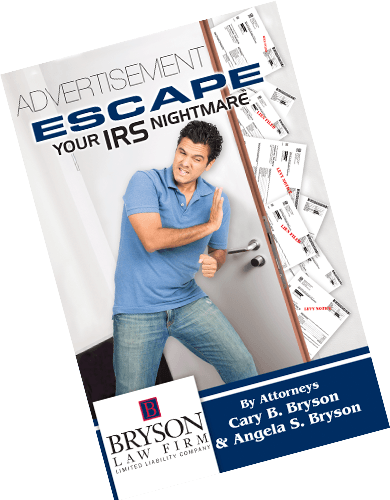 "Louisiana Tax Amnesty 2014 - Round Two!" The Louisiana legislature is working hard on House Bill 663 to approve another round of tax amnesty to begin in the Fall of 2014. The apparent motive appears to center on helping the state balance the budget for the upcoming fiscal year which begins on July 1st. Lawmakers hope to raise approximately $10 million by enticing delinquent taxpayers to come forward and pay.